We are delighted to launch the Nanopavilion, showcasing Members and nanotechnology at important industrial meetings around Europe. The Nanopavilion is a dedicated stand over 40m², with individual booths for NIA Members, creating a focal point for nano within large scale conferences and enabling NIA members of all sizes to gain maximum exposure. 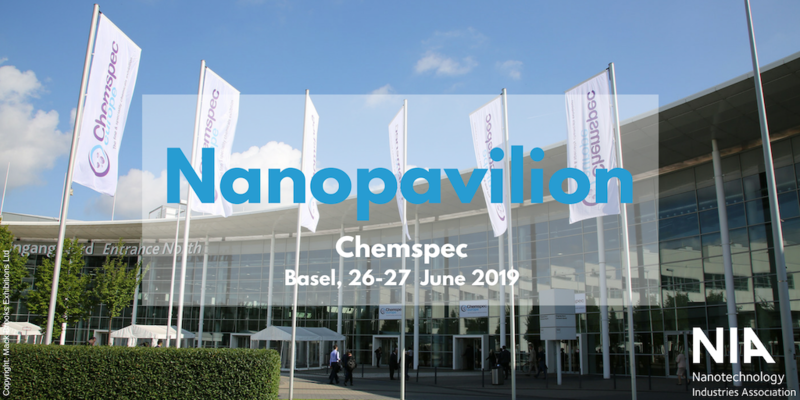 Chemspec Europe, June 26-27 in Basel welcomes our 2019 Nanopavilion. Chemspec is an international exhibition for fine and speciality chemicals, this year in the heart of pharma and chemicals production territory in Switzerland. In 2018 it welcomed over 6700 delegates and 358 exhibitors in Frankfurt. The Nanopavilion will be the focal point for nanotechnology activities at the trade show, with NIA Members from Europe, the US and Canada flying the flag, at the pavilion directly and through presentations in the event programme. NIA Members Celluforce, Cerion, Chemycal, Douglas Connect, VITO and Yordas Group kick start the 2019 Nanopavilion, presenting an excellent opportunity for Chemspec visitors to network with advanced nanomaterials production and expert service provision. NIA will host a webinar dedicated to Chemspec and the Nanopavilion partners on March 6 at 1500 CET. Interested parties are welcome to attend to find out more about the NIA Members taking part and how their nanotechnology products and services support your work. Find out more HERE.